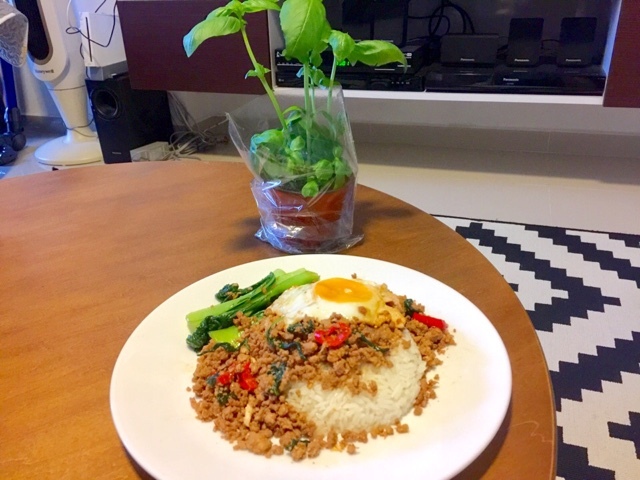 How to cook Thai Basil Minced Meat? I was shopping for what to cook at NTUC Finest when I came across a beautiful Sweet Basil plant. 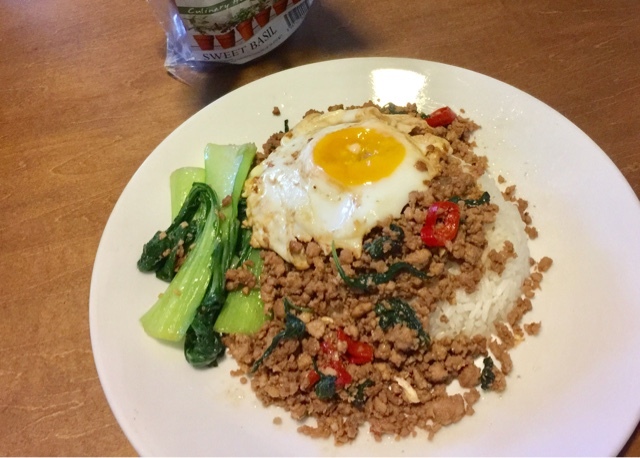 Thai Basil Minced Pork with runny sunny side up is such a delicious complement to white rice. The oozy egg yolk mixed with the minced meat that has absorbed the wonderful flavours of basil leaves and Thai fish sauce is a taste that is worth the cooking. I chose and purchased Indonesia minced pork from NTUC Finest over Australia pork because I heard that Indonesia pork is not smelly and tastes sweeter. You can replace pork with chicken or beef. There is no need for any marination so it is a relatively easy and impressive dish to prepare since this is a popular Thai dish. Let's start cooking! I put sufficient amount of oil on the pan and waited for it to be heated up on medium heat for amateur cooks. If you are a noob, low heat. If it is too hot, the chopped garlic would be burnt very easily and your dish would be ruin. You would cry. When the pan is heated but not extremely hot, I added the chopped garlic and red chilli. As my family does not eat spicy, I bought the normal chilli instead of chilli padi. If you are free, you can pound your own chilli and garlic to release the flavours. If you are tired and busy, this would do. When there is an aroma of garlicky chilli and that the garlic was still golden brown (not dark brown), I added the minced meat and turned the stove to high heat. I kept separating the meat until it was really in bits. If you have a bad day, this step could even help you vent your frustrations as you tiok the meat. While the meat was still pink, I added fish sauce, dark soya sauce and a very small amount of oyster or abalone sauce. Fish sauce can be very salty. If you are not confident, it would be good to add a small amount first, taste your food, and adjust later. I also added 3 tiny pieces of rock sugar to give the dish a good Thai balance of sweet, salty and slightly spicy. Sugar would do the trick as well. Once the meat was about to be thoroughly cooked, I threw in the freshly plucked and washed basil leaves. I pluck quite a lot of leaves, more than 10, in order for the basil taste to be distinct. The leaves would cook very quickly and continue to wilt while the dish was hot. I poured a generous amount of meat on the rice and top it up with a runny sunny side up which is a must have. The egg would not only add texture, but also balance the saltiness of the meat. If you are throwing health to the wind as you want to have fluffy sunny side up, the secret is to deep fry it and it would puff up at the sides. As you can see from the picture, my egg is the healthier version. Ha Ha. It is so cool to cook using leaves off a living plant. It makes me feel like I am a real chef, plucking leaves from my herb garden. I shall buy more herb plants!